Marjorie Bridges-Woods is one of the most successful fashion moguls the world has ever produced. Apart from being known as a successful fashion empress, she also gained fame as the wife of renowned comedian, Tv personality and actor; Steve Harvey. Her quest to be relevant in the fashion world went one step closer to reality when she founded the fashion blog; The Lady Loves Couture in 2007. Ever since, she has attained an enormous amount of wealth and has also recorded over 1.6 million followers on her Instagram pages. Here is all there is to know about the successful fashionista. Born as Majorie Bridge on October 10, 1974, to her parents who she shares an amazing bond with, she adopted her other name Woods from one of her previous marriages. Marjorie couldn’t be more proud to be born to her parents who she flaunts regularly on social media but has also made a conscious attempt at hoarding their personal details. The much we have gathered so far is that her mother’s name is Doris Bridge. She was born in the United States of America and is of an African-American heritage. For Marjorie Bridges-Woods education was not something that interested her as records have it that she attended the University of Memphis but dropped out as a result of her rebellious nature. Now she can be counted as one of the many successful women in the world who are dropouts alongside the likes of Ellen DeGeneres, Oprah, Lady Gaga, Rihanna and the rest of them. But as time rolled by, she picked up interest in the fashion world and decided to chase it as a career. The Fashion mogul didn’t start her career on a small scale, she hit it big as a professional and in a short period, she began to travel around the world to attend different fashion shows. Having gathered some amazing skill from her travels in the fashion world, she then decided to start up her fashion blog named The Lady Loves Couture birthed in June 2007. There, she uploads tips about the fashion world, tips on being a powerful woman, secrets to the beauties of the world and details of all her intriguing fashion excursions. The blog is said to have 368.6k Followers on Instagram. As an entrepreneur, seeing the success of the blog, the fashion mogul decided to make her tips worthwhile by running an online shopping platform where she sells Handbags and Clothes to further help fans to products that may appear as tips on the blog. This has been very successful so far. Her personal salary and net worth are still unknown, however, we stand to believe that she has made a fortune for herself. As far as relationships go, Marjorie Bridges-Woods has passed through some good and bad times which seemed to have kept her down until she finally met Steve Harvey who is 17 years older than she is. She has attempted matrimony thrice, although, her other two marriages are yet to be confirmed. Some records have it that these marriages were false while others tend to agree that they really happened. So far, there has been no concrete proof to go by but it is said that her first marriage was to Jimmy Townsend. he is allegedly described as a criminal and is said to have been sentenced to life imprisonment. The duo couldn’t work out their marriage and decided to take a bow out. Her second attempt was with Darnell Woods but like her first, Darnell was also known as a criminal and a drug lord. Moreso, it is also rumored that he introduced Marjorie Bridges-Woods to the act of drug dealing. They were said to have had a strong bond until Darnell’s consistent arrests became unbearable. She couldn’t deal with it and divorced him after having gained custody of her children. The god of marriage decided to make her smile again and reunited her with her long-lost love; Steve Harvey. The two had met at a Memphis Comedy Club in the 1990’s where Steve couldn’t hide his feelings and promised to marry her the night they met. However, Steve left to chase his career and the duo lost touch for a while and finally ignited their love in 2005 after Steve divorced his ex-wife, Mary Lee Shackelford. 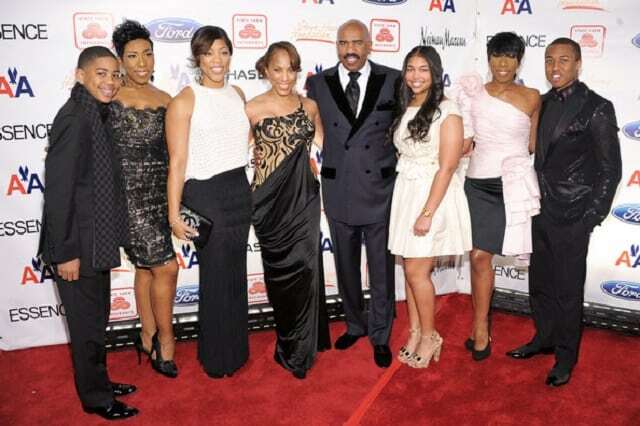 Steve Harvey and Marjorie Bridges-Woods dated for two years before tying the knot on 25 June 2007. Ever since their union, Steve’s wardrobe has taken an excellent turn as they both grace a lot of gatherings looking stunning as a power couple and have also earned a name as the Low-Key Style Stars of Fashion Week by People. Steve and Majorie’s union has not produced any offspring just yet, nevertheless, they have played excellent roles as parents to their seven children, 3 from Majorie’s previous marriage and 4 from Steve’s previous marriage. Marjorie’s children are two daughters- Lori and Morgan and a son – Jason. Upon her marriage to Steve, her children all adopted Steve’s last name, Harvey. On steve’s part, he has four children twins- Karli and Brandi from his first marriage to Marcia Harvey and two sons Broderick Steve Jr., and Wynton from his second marriage to Mary Lee Shackelford. Marjorie Bridges-Woods is also a grandmother as her first daughter, Morgan is married to Kareem Hawthorne and their union has produced an Offspring. The family had difficulties blending initially, nevertheless, the power couple told People in May 2016 that they had worked together and have finally created a blended family.